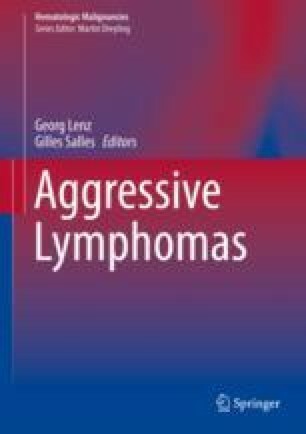 Diffuse large B-cell lymphoma (DLBCL) is currently treated with immunochemotherapy based on the R-CHOP regimen (see Chap. 5). Depending on the clinical risk factors summarized by the International Prognostic Index (IPI) and some molecular characteristics of the tumor, about two thirds of patients are cured with standard first-line therapy, whereas one third is primarily refractory or relapse in the further course of disease (Friedberg JW, Hematol Am Soc Hematol Educ Program 2011:498–505, 2011). Thus, the addition of rituximab to CHOP chemotherapy has dramatically improved survival of patients with DLBCL and largely contributed to the development of monoclonal antibodies (mAbs) in DLBCL and more generally in cancer (Coiffier B et al., N Engl J Med 346:235–242, 2002). This first clinical success of immunotherapy led different companies to develop new mAbs targeting new surface molecules or being modified to elicit increased immune activity or to bring chemotherapy or a radioactive isotope closer to the tumor cells. Patients who relapse after R-containing first-line therapy (Gisselbrecht et al., J Clin Oncol 28(27):4184–4190, 2010) showed their dismal prognosis; the recently published SCHOLAR-1 study described an objective response rate of only 26% (complete response rate 7%) and a median overall survival of 6.3 months for patients with refractory DLBCL (Crump M et al., Blood 130:1800–1808, 2017). Taken together, the enormous difficulties in successfully managing patients suffering from refractory or relapsed DLBCL demonstrate that novel therapeutic approaches are urgently required. In contrast to other novel approaches discussed below, chimeric antigen receptor T cells (CAR-T) showed remarkable response rates and ongoing remissions in early clinical trials, even in heavily pretreated patients who had failed multiple salvage regimens. Thus, CAR T cells seem to become an important pillar in the therapeutic management of lymphoma even when immunochemotherapy, radiotherapy, and the use of small molecules fail.